For the 1996 model year, Porsche had only one model available and it was the 911 (993). The front-engined cars were all gone and Porsche was not exactly in sound financial shape in the early and mid-1990s, in part because of the expense of producing three distinct model ranges (911, 944 and 928) side by side. The company needed a lot to solve its financial woes, but two steps were more efficiency on the production lines and higher sales volume. The opinion held by executive Horst Marchart was that two different models could be designed using many of the same front-end components. This would save money because the A-pillar forward is where most of the development costs of an automobile are incurred. The cheaper “entry-level” Porsche would be the Boxster (also known as the 986), and because it would have to be designed alongside the 911, it had to share quite a bit with the upcoming 996. Several engine designs were considered, including four cylinder units, but in the end a version of the “New Generation” flat-six was used for the Boxster. It was similar to the unit eventually released in the water-cooled 996 version of the 911, but displaced 2.5 liters instead of the 3.4 of the 996 and was placed immediately behind the driver instead of in the rear of the car as in the 911. Inspiration for the Boxster came from past Porsche favorites like the 550 Spyder and even included a single central exhaust outlet like the 1950s racer. That said, the Boxster was far from a basic, bare bones sports car. The car needed to appeal to a wide audience, and that meant it had to have a certain degree of convenience and luxury. First, the top was power operated, and could fold away neatly under a cover in 12 seconds. A wind deflector between the roll bars reduced wind noise and there were numerous power features as well. An optional 55-pound hardtop was also available, as was an odd “roof-transport system” that was essentially an open hardtop frame with a rack for skis, a bicycle or even a surfboard. Radiators to cool the M86 engine were located behind the front wheels, and condensors for the air conditioning were placed in front of each radiator. This left room in front for storage space, effectively giving the Boxster one trunk behind the engine compartment and another one in front of the driver. Initial demand for the Boxster was so strong that Porsche eventually reached a deal with the Valmet company in Finland, who had just finished a contract building cars for GM, to assemble more Boxsters. Most first generation Boxsters would then be built in Finland, and are distinguished by a “U” in the VIN, while cars assembled by Porsche in Zuffenhausen have an “S” in the VIN. Otherwise, there are no significant difference between Finnish-built or German-built Boxsters either in terms of build quality or desirability. Special versions of the Porsche Boxster included a 2004 50th Anniversary version, and the most desirable color for the Boxster is Seal Grey. 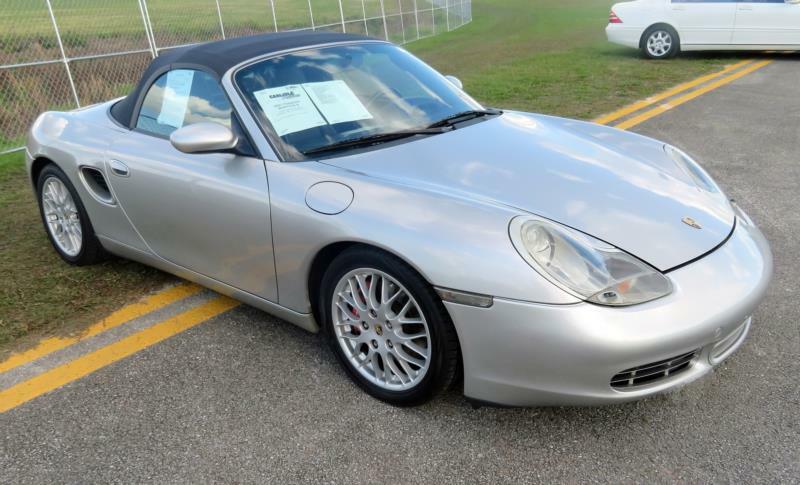 In 2000, the model was revised with a more powerful 2.7-liter engine and a new Boxster S with a 3.2-liter engine. In 2002, a glass rear window replaced the old plastic one and there was a new steering wheel as well as several exterior cosmetic tweaks. Like the 996, the Boxster had a bit of a tarnished reputation thanks to the infamous IMS bearing issue. Bearings on the intermediate shaft that drives the camshafts indirectly off the crankshaft only failed in a very small percentage of cars, but failure of the bearing meant catastrophic engine failure (requiring a rebuild) and Porsche did not handle the issue well from a PR perspective. Since the preventive maintenance on the IMS bearing is a larger percentage of the value of the relatively cheap Boxster, fewer examples will have had the issue addressed, although a car with significant mileage will be unlikely to experience the problem by now. Предлагаем 220km.net в любом городе.